We no longer make separate trial build of the control assemblies. Instead there is a new LicenseKey property, which disables a component’s evaluation mode. If your application contains more than one control by MindFusion, you could call MindFusion.Licensing.LicenseManager.AddLicense(key) to specify the key once instead of setting it per each control. License key strings are listed on the Keys & Downloads page at MindFusion’s customer portal. The ZoomControl class from MindFusion.Common.WebForms lets users change interactively the current zoom level and scroll position of a DiagramView or a MapView. To set it up, add a ZoomControl element to the page and set the control’s TargetId property to the id of the view. The control has numerous properties for customizing its appearance. 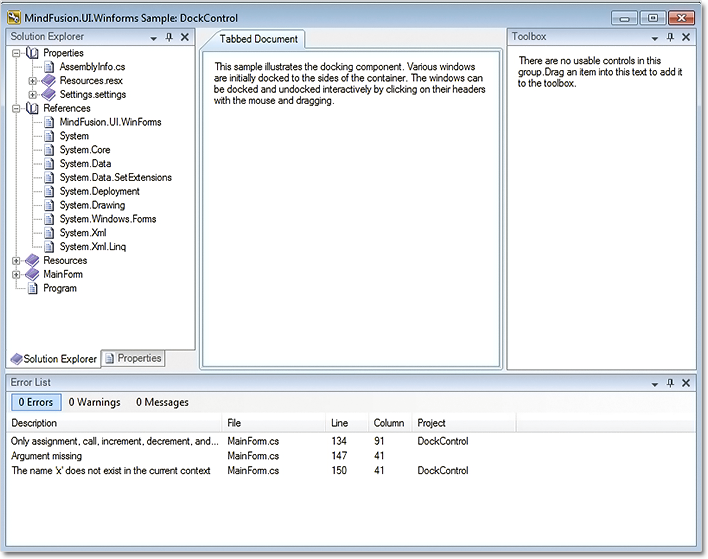 MindFusion.WebForms components can now be installed automatically into Visual Studio 2015 toolbox palette. Line charts now support custom formatting of labels. To use custom formatting, set LabelFormat to NumberFormat.Custom and use LabelCustomFormat. The algorithm for sorting of bars has been improved. Bars in a series or in clusters can be sorted in ascending or descending order – use the SortOrder property. You can also sort each series/cluster with the SortSeriesBy property. Bar can be sorted with their colors preserved if SortColor is set to true. Shape property of TableNode and ContainerNode is now supported in Canvas mode. CellFrameStyle and EnableStyledText properties of TableNode are now supported in Canvas mode. CellTextEditedScript event raised when users edit the text of table cells. CreateEditControlScript event lets you create custom DOM element or fragment to use as in-place text editor. NodeListView raises nodeSelected event when the user selects a node. Load XML files from client side by calling loadFromXml method of Diagram class. as well many more new properties and events. The ZoomControl class lets users change interactively the current zoom level and scroll position of a DiagramView. 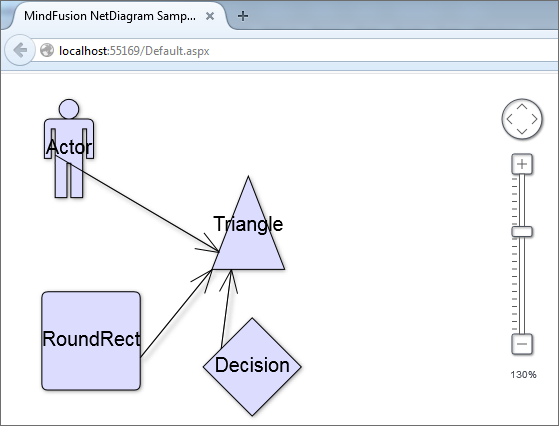 To set it up, add a ZoomControl element to the page and set the control’s TargetId property to the id of a DiagramView. The control offers numerous customization properties like ZoomStep, ScrollStep and various appearance setting properties such as Fill, BorderColor, CornerRadius and TickPosition. 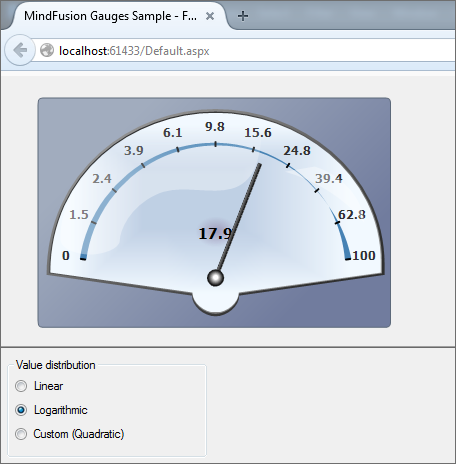 Linear and oval gauge controls have been added to MindFusion.WebForms pack. The gauges are drawn on client side using HTML Canvas API. Users can change gauge values interactively by dragging their elements. Horizontal layout has been added to the Timetable view. The horizontal timetable view displays a collection of rows where each row represents the allotment of resources to distinct hours of a day; the rows in this view represent dates, tasks, locations, contacts or resources. The bundled jQuery version has been upgraded to 1.11.2. You can read further details about the release at the announcement page at MindFUsion discussion board. Now you can resize multiple selected nodes simultaneously – just set the AllowMultipleResize property to true. When enabled, dragging a corner or any side adjustment handle of a node, resizes all nodes in the selection. The Item argument of ImportItem event handlers is now pre-set to a DiagramItem instance created for the imported Visio shape, letting you avoid parsing some standard data such as Bounds or Text. You can either modify this item’s properties, or replace it with a new instance of a different type. LinkLabels are now copied by the DiagramLink copy constructor and clipboard methods. DiagramView.ZoomFactor setter no longer automatically aligns its value to ZoomControl zoom steps. This avoids imprecise ZoomToFit results. a few API changes have been made. The new version fixes several bugs and offers improved binary and XML serialization. The new version is not compatible with old binary and XML formats. A DockControl (beta version) has been added to the pack. The new DrawImporter class lets you import *.odg files created by the OpenOffice Draw Vector graphics editor. You just need to add a reference to the MindFusion.Diagramming.Import.Draw.dll assembly and are ready to use it. 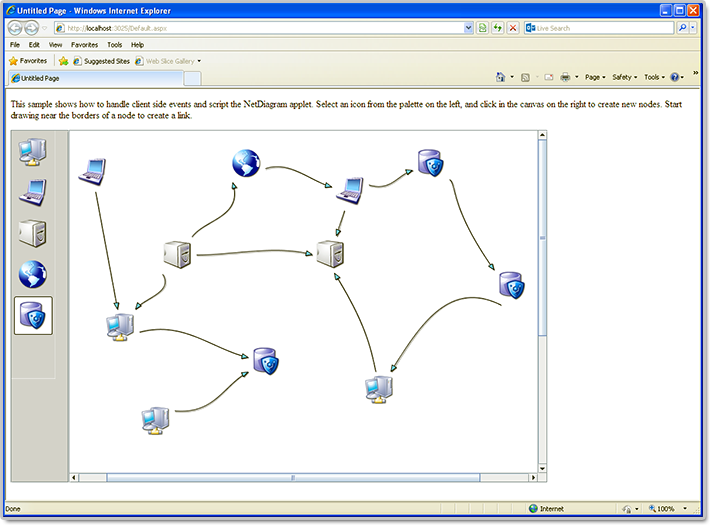 You can use various overloads of the Import method to import the OpenOffice drawing into a DiagramDocument whose pages correspond to the Draw pages, or into a single Diagram whose content is merged from all imported pages. The CanvasVirtualScroll property of DiagramView enables virtual scroll mode. The MeasureUnit property now supports Centimeter and WpfPoint values. The latter allows loading diagram files saved by WPF and Silverlight versions of the control with their default units. SwimlaneLayout now honors the Anchoring.Keep property value. New line and quote characters in Tag strings are now escaped when passed to client-side click events in ImageMap mode, avoiding script errors. Chart themes are now XML files that you can save and load with the SaveTheme and LoadTheme methods. You can use the theme editor tool provided with the control to edit, save and load themes in a fast and intuitive way. The control provides an initial set of 8 predefined themes. 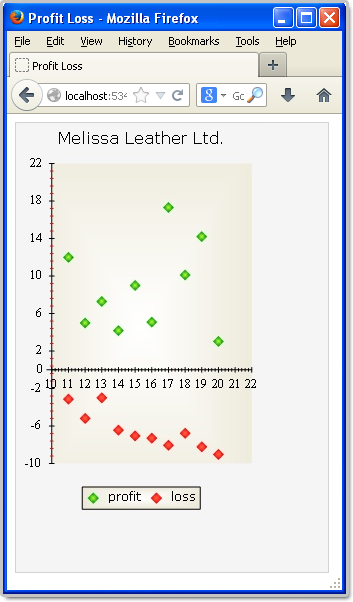 Use the new MajorTickLength and MinorTickLength properties to divide a chart axis in a more precise and accurate manner. The number and pen for the ticks are set with MinorTicksPerInterval, MajorTickPen and MinorTickPen. You can apply tooltips on all chart types. Area charts in particular can show a different tooltip for every region between two adjacent data points. 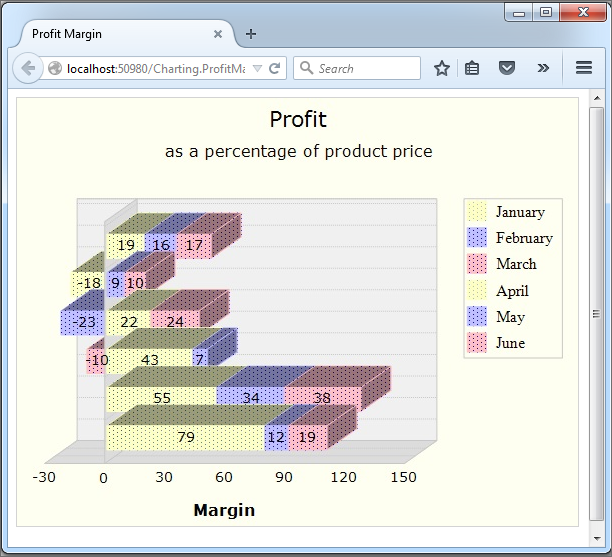 Line and bar chart elements can be dragged with the mouse. Bars can be dragged either in horizontal or vertical direction according to their orientation. Line chart points can be dragged in any direction. The dragging behavior is set with the Behavior property. As well other useful new features. About MindFusion.WinForms Pack: A set of WebForms components that add great variety of features to your ASP.NET application with a few mouse clicks. The pack contains advanced components for diagramming, scheduling, charting and UI (Accordion, ColorPicker, TabControl, Window, WindowHost, DockControl, Button, Slideshow, Zoom and more). Each tool boasts easy to learn and use API and is quickly integrated into any web application that targets the ASP.NET platform. The controls support numerous options for styling, data import / export, user interaction and offer rich event set. There are plenty of samples and step-by-step tutorials as well detailed documentation.